This two-part workshop, on Saturday afternoon, Jan 26th, and Sunday morning, Jan 27th, will get you started on unraveling the mysteries of gull identification. Actually, most gulls are not very difficult to tell apart, though adult and juveniles of most species look very different. We’re going to give ourselves confidence with identifying the easier plumage’s of our common species, and then tackle the more challenging intermediate plumage’s and the less-common species. 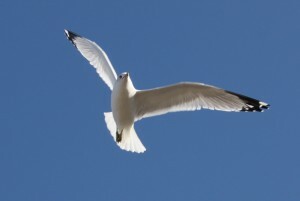 1:00 pm-2:30 pm – Beginning Gull Identification. Using Powerpoint and book resources, we’ll start with the basics of gull identification, such as feather topography and aging. We’ll then focus on our most common species: Ring-billed, Herring, Great Black-backed, Laughing, and Bonaparte’s Gulls. 3:00 pm-4:30 pm – Advanced Gull Identification. Now comfortable with the basics, we’ll move on to the uncommon species: Lesser Black-backed, Iceland, Glaucous, and Black-legged Kittiwake. Next up will be the rarities: Little, Black-headed, and yes, even “Thayer’s.” We’ll touch upon “Megas” such as Mew, Slaty-backed, and Sabine’s, and we’ll discuss hybrids. Finally, we’ll apply what we have learned to tackle and understand some identification quandaries, such as the famous “Westbrook Gull” before we finish up with some photo quizzes to test our new-found knowledge. We’ll meet in Portland (Back Cove parking lot on Preble Street Ext, opposite the Hannaford’s) to carpool around the area to apply what we have learned. We’ll spend some time with our most common species: Herring, Ring-billed, and Great Black-backed, and then seek out Iceland and Glaucous, and perhaps we’ll find something even better! We hope that you will join Derek for this workshop to foster appreciation for this fascinating group of birds. Derek (with his wife Jeannette) owns and operates Wild Bird Supply in Freeport. He’s the author of “How to Be a Better Birder” and “Birdwatching in Maine, A Site Guide,” the most comprehensive guide to where to bird in Maine. York County Audubon is sponsoring this Workshop. There is a registration fee of $20 for YCA (or Maine Audubon) members and $25 for non-members, payable at the door. Space is limited. Please register by signing up using the form below. Weather dates or Workshop updates will be posted on the York County Audubon website and Derek’s Web Page (freeportwildbirdsupply.com/birdingtoursinMaine.asp).